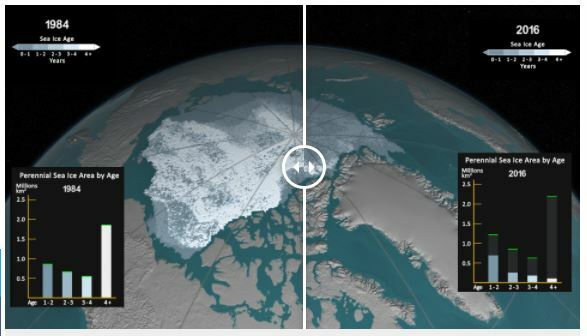 Home » Abrupt Climate Change » See how Arctic sea ice is losing its bulwark against warming summers – an ending in more ways than one. A graph in the lower right corner quantifies the change over time by showing the area in millions of square kilometers covered by each age category of perennial sea ice. This graph also includes a memory bar — the green line that represents the current maximum value seen thus far in the animation for the particular week displayed. For example, when showing the first week in September, the memory bar will show the maximum value seen for all prior years’ first week of September since the beginning of the animation (January 1, 1984). This isn’t happening because we’re going through a mini-ice age. This isn’t happening as a fluke. This is happening because our planet is warning. The oceans are warming. The global weather patterns are changing, destabilizing, becoming more treacherous with mega storms and events we never even heard of before. As of January 2018 there are 408.05 ppm of CO2 in our atmosphere. The last time there was this much CO2 was more than 1 million years ago. This is not fake this is very serious. These weather changes have a ripple effects from micro-organisms to mountaintops. There are massive die-offs of life all around the planet all the time because of it. If journalists and politicians try to talk about it they’re called fake. Scientists are being fired or gagged. We ARE the frog in the pot of water on the burner. And now, the reasonable ones, they’re saying our only hope is Geoengineering, which is already happening by the way. Can you picture a happy ending with humans further messing around with planet’s atmosphere, CO2, methane, etc? I can’t. This is the band aid proposal because it doesn’t fix the root cause. It is very very hard to not see this as some sort of game over scenario. It is on this note that I’ve decided to end this blog. The twitter account will persist. Awhile back I wrote that I was scaling back. But the truth is that there is really nothing new to report. It’s the same horrendous information being repeated over and over again and mostly falling on deaf ears. People don’t want to know about this stuff. This method is not reaching anyone, not really. It’s time to get out and get local or go to where you care and act there. That’s what I’m going to do. Things are not getting better. They are exponentially getting worse. Best of luck to you all. Keep using your abilities to critically think about what you read and hear. Don’t blindly follow your peers. Do your own research. Prioritize what is really important to you. Good luck and gods bless you.